To charge the Sanyo eneloop Ready To Use (long shelf life) AA cells I wanted a good charger and asked Thomas Distributing what they recomend. I had also read that this charger did a good job on Ni-MH AA cells so got it. There was a notice in the box saying that the cover has been removed on this improved model. It appears to take four of either AA or AAA cells and there's a switch for FAST or SLOW charging. In fast charge mode it may fully charge the Sanyo eneloop cells in 20 minutes. Since the LEDs change from red to green and there's no sound, it's hard to know when it's finished charging. The cells are warm (nice to hold on a winter day) but not hot. 23 Oct 2007 - the factory says that they are using a discharge pulse along with the charging pulses, but only every now and then not between every charge pulse, so this is really a Burp Charger (I like them). 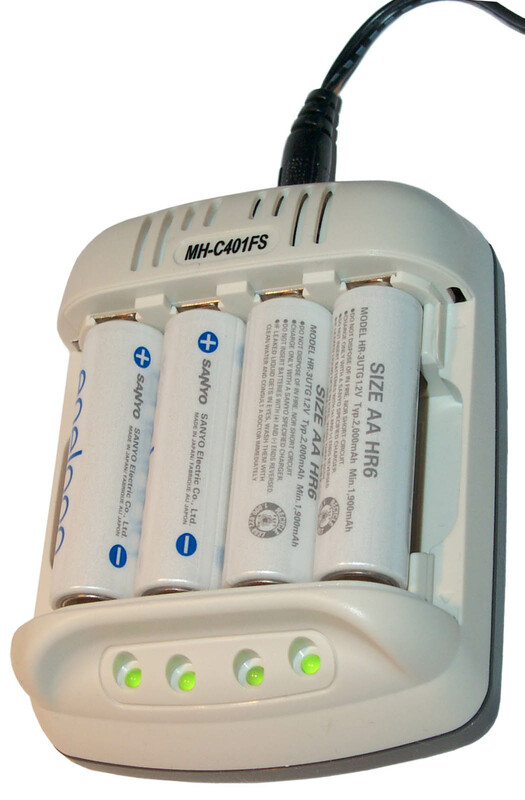 Rapid charge Ni-MH AA batteries in under 100 minutes, cooly and efficiently. The unique charging algorithim developed by battery experts allows the battery to accept a more complete charge. Four independent charging circuuits to ensure optimum charging for each battery. Ultra low temperature charging using PowereEx's unique FLEX NEGATIVE PULSE algorithim. Manually switch between 100 minute fast charge and 8 hour gentle charge, both microprocessor controlled. Can be powered by AC adapter and cigarette-lighter car adapter. Note that California either has or is about to pass a rule about "always on" electrical devices in terms of their energy efficiency. 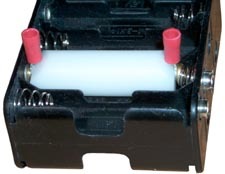 The supplied 12 Volt wall wart is one of the new Switching Mode Power Supply types that is much smaller and lighter than the older linear wall warts rated for the same power. They also have a big advantage in the you can stack them cheek to jowel on AC power outlet strips. The input is "12 Volts" and it may take a Kobicon 3209, Mouser 171-3209 DC Power Plug (I haven't tested that, but it comes close the measured plug ODxID of 3.77 x 1.3mm). When Four dead cells are connected at the same time in the fast charge mode the power supply current at 12.0 volts input exceeds 1,000 ma. As each cell becomes charged (green LED) the current drawn by the charger drops. After all the cells are charged the current draw is under 40 ma. Note that the small wall wart power supply is one of the new California compliant type that's energy efficient. These are much lighter and smaller than the old linear regulator type. They also are skinny in the correct dimension so that you can stack them cheek to jowl in outlet strips. In order to measure the shelf life on the eneloop Ready To Use batteries it's necessary to get some idea of how repeatable (note 4) the same cell can be measured. For example if a 2000 mAh cell can be measured to better than 100 mAh but not as good as 10 mAh (the numbers I think as of 23 Nov 2007) then the minimum time between shelf life tests can be estimated. Reading the literature on battery capacity and talking to the Sanyo engineer who did the shelf life testing indicates that there's a strong function of temperature present, the recommendation being that all testing be done in a temperature controlled chamber. So far I'm doing all the testing at the table where my computer is located. This is an indoor location that has heating (some by the computers and other equipment that's running 24/7 and a small floor heater or the whole house heater or air conditioner. The temperature is about 60 F.
The C401FS adds a topping charge after it makes the charge termination decision thus filling the battery completely. The negative delta V charge termination method is known to prevent over charging and to provide about 85% of the capacity of a standard 16 hour charge at 0.1C. If the negative delta V charge termination method is sensitive to temperature then the capacity testing results when using it will show much more variance than the 16 hr 0.1C charge or where there's a topping charge. This may be the reason that Sanyo is not recomending negative delta V and the reason I'm getting better than 1% repeatability after changing from the C9000 to the C401FS caharger. I'd like ot use this charger on other cells, likeSubC aka SC or "D" size. A way to do that would be to put a dummy battery into the C401FS and run wires to a battery holder for the target battery size. This is the first prototype adapter that meets the outline drawing for a AA battery, but there are further requirements that need to be met for operation in the C401FS, although it does fit. 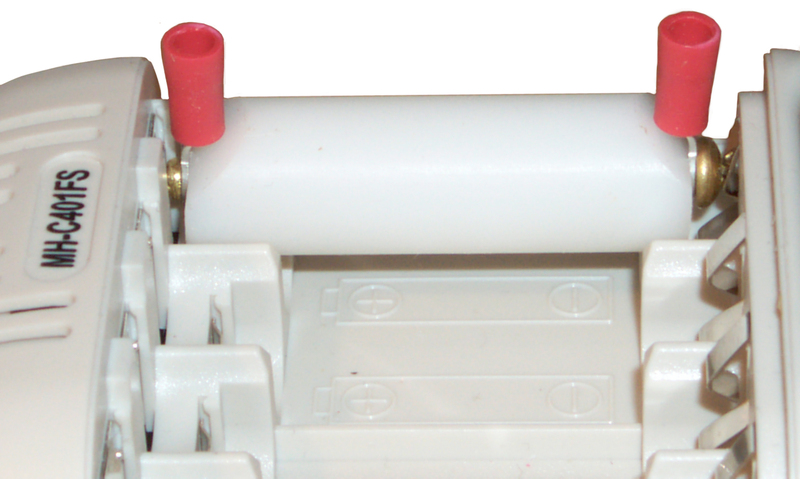 The C9000 charger/discharger/conditioner also has it's own requirements which will be included in the next prototype. 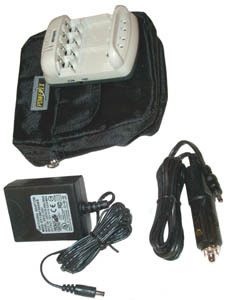 The adapter can be installed in places where there is an open space for the terminals and wires to exit but not things that are closed like a flashlight. 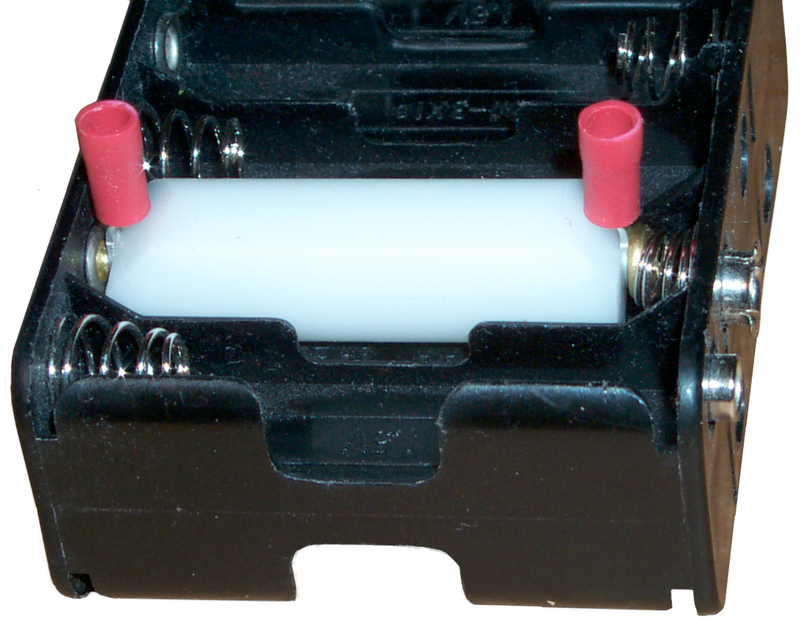 For example to test a 10 AA battery holder one, two or as many of the AA to wire adapters could be installed allowing measurement of the holder. If you are intested in this type of adapter please let me know for what size battery. Imaging Resource Review - I believe that the 401FS will take cells to very nearly 100% capacity if they're left in it overnight, to let the trickle charge "top off" the cells, but I haven't tested overnight charge cycles yet for this charger. Don't run the charger with the lid closed -(B.C. note: the lid no longer is part of the 401FS) NiMH cells lose anywhere from about 1-3% of their charge each day..
[an error occurred while processing this directive] page created Oct 19, 2007.